I find the following new release from Welder interesting. These watches have the bull head design, where the crown and buttons are at the 12 o'clock position as opposed to the normal 3 o'clock position. 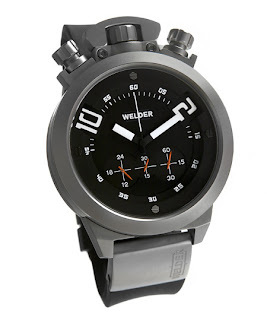 There are 2 watches (at the moment) in the Welder K24 collection that have this design. The first watch is the K24 3504. This watch features an automatic, well kinetic movement. The movement, YT 57 is probably sourced from Seiko. The watch is large at 50 mm is made from 316L Stainless steel. It has the following functions; hours, minutes, seconds and date (displayed at the 9 o'clock position. The date display is unique in that the date window is large and will display 3 dates. This is useful when the minute hand is over the current date (shown in the center), you can still tell the date as you can see the date before and after. The dial is made of 2 superimposed black dial with white Arabic numerals for hour and minute index. The watch is water resistant to 10 ATM. The watch comes with rubber straps and steel butterfly buckle. 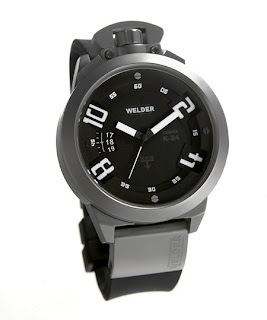 The second watch is the K24 3505. This watch is fitted with a Miyota JS55 chronograph movement. This movement is unique as the chronograph second hand is not centrally mounted, but rather on a sub-dial. When reading the chronograph sub-dial, from left to right, 24 hour hand, minute hand and second hand. The centrally mounted hand is the normal continuous moving second hand. The watch features the following functions; hours, minutes, seconds and chronograph. It is a large watch at 50 mm. The case is made of 316L stainless steel. The dial is made of 3 superimposed black dial with white Arabic numerals for hour and minute index. As with the 3504, the watch is water resistant to 10 ATM and is issued with the same type of strap.